My greatest accomplishment is getting up each day and doing it all over again. Day after day, year after year, I am building a solid foundation that will not crumble under the storms of the world. There may be shake ups now and then, but I have tremendous satisfaction in my daily blessings and holding firm to my values and beliefs. I shy away from gossip, materialism, profanity and negativity. I try and elevated myself and those around me. It is a daily effort and I am blessed to be committed to making my realm a better place. Other than that, my greatest accomplishments call me Mom. People often say it’s hard to explain until you have felt it, like childbirth. My greatest happiness comes when my family is all together and getting along! It’s an elevated feeling. A bit of heaven on earth. My faith in Jesus Christ is strengthened when I ponder the scriptures and pray earnestly. I often imagine the Savior watching over me, and I can feel his love and care and comfort permeate my consciousness. How has one of your spiritual gift/talents benefited your life? I have been so very blessed to have the gift of a positive attitude and a connection throughout my life knowing that there is more to this earth than meets the eye. My trials have been severe at times but I’ve known that there is a loving Heavenly Father who cares about me, my pain, my sorrows, my joys, my choices. He wants me to be happy. I had to learn that my choices affect my happiness. When I learned to lean on my Heavenly Father, the quality of my life improved immensely. 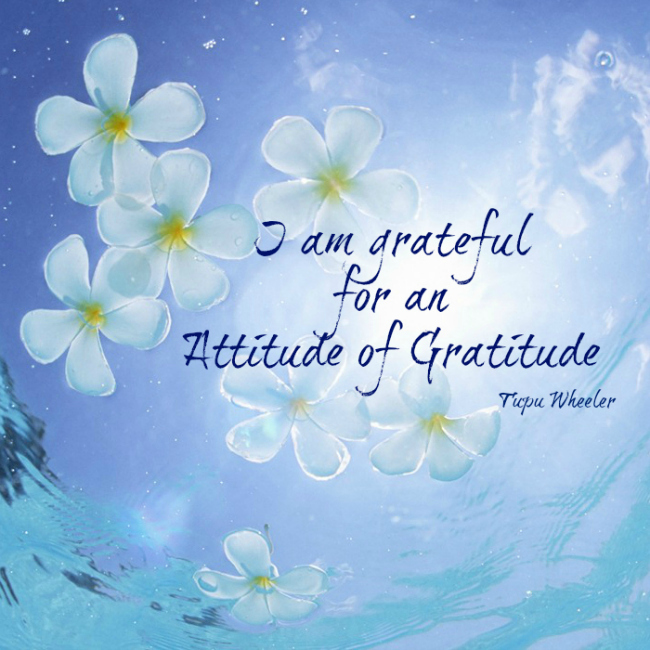 I am grateful for an attitude of gratitude. How do you know you know when you’ve received answers to prayers? When I approach the Lord in prayer with reverence, I can sense his companionship. The more I pray, the closer we become. A big part of prayer is pouring out your heart and then listening. We don’t always get answers right away. Part of our purpose in life is to gain patience in the Lord’s timing. Sometimes an answer comes in a welling up of emotion, kind of like a lump in your throat. Sometimes you feel his love by a still small voice. When we are trying to live in a way to please the Lord, He can abide with us. The relationship is profound and so worth the investment. You will never be alone. I was raised in a home where we went to church, but I still had to come to the point in my life where I needed to find out for myself if I was a believer. I knew I couldn’t rely on the testimony of others to carry me through life. I was going through a rough time in my life. Some of my heart ache was because of my own choices and most of my turmoil in life was from immense grief. I was orphaned in my teenage years when my parents and my brother were killed in car accident. My sister had died the year before in a different accident and I was almost unable to function. Outwardly I held it together, but inside I was devastated. I felt alone; my purpose for enduring escaped me. Praying became my lifeline. I knew I was not alone. By staying active in church, I made connections that still carry me through life to this day. I am deeply grateful for my testimony of the love of Jesus Christ and his plan. It had guided me a sustained me. My everyday life and decisions have meaning. I want to have a feeling of love and happiness in my home and all around me. I try to live with kindness in my heart and teach my children compassion and responsibility. I try and reach out to those I come in contact with and share my joy. I’m not one to preach, instead I usually can see the good in everyone and enjoy and appreciate their God given gifts. It’s a wonderful feeling to remember that everyone is a child of God. He knows our hearts. The women of the world carry the keys to our future. They are the ones to nurture the next generation. The responsibility is a true partnership with God. Not only in giving birth is there a creative force, but in leading and guiding those that we have an influence over. Goodness will prevail if we are brave enough to stand up for what is right. We cannot be silent and hope for the best. Just like you would guide a child to protect him or her, we must protect humanity. We must be part of the host of angels on earth to outnumber the followers of the adversary. We are beloved daughters of Heavenly Father. We are special. Collectively and individually. Angels on earth. That’s me and YOU!